Stress within your comfort zone can help you get things done, motivate you, even get you out of a dangerous situation. 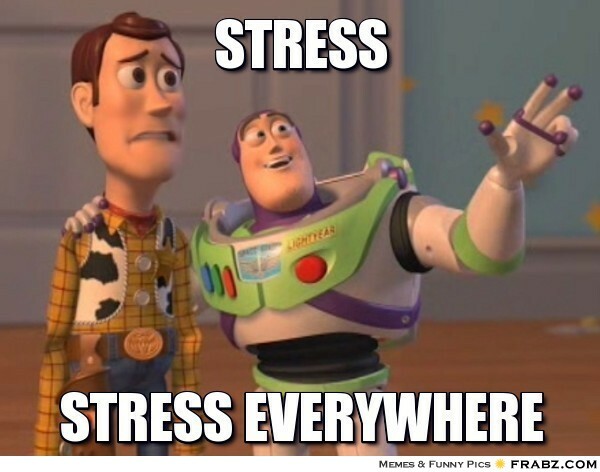 But when stress becomes overwhelming, it can lead to an increased amount of hormones being released that can really make you feel like you’re losing your mind (literally). Here are a few tips that will help you to recognize potential signs of stress. It’s ok to occasionally feel excessively tired but having the feeling repeatedly is unhealthy. “Stress is an energy-drainer, because it secretly sends all of your body systems into overdrive,” says Jane Pernotto Ehrman, M.Ed, a behavioral health specialist at Cleveland Clinic’s Wellness Institute. This is the classic “tired and wired”, with an increased lack of sleep your body goes on overdrive. When you’re in high-stress mode, your immune system can be suppressed up to 30% — making you more likely to catch every single cold or flu that’s circulating around your school. So if you’ve already taken a million sick days this year, it could be a signal that you’re overwhelmed. 4) You are forgetting everything! Your brain can only take so much, all the stress will pile up and completely way down your thinking process. Your memory goes fuzzy, your focus becomes non-existent, and your ability to actually listen gets squashed. It’s like stress hijacks your brain. Think about the last time someone spooked you: Your shoulders instantly scrunched up, right? And your neck muscles tightened? Well, that response to danger actually dates way back to caveman days: “It’s an animal instinct to protect the jugular,” says Ehrman. But the tricky part is, your brain can’t distinguish between an approaching tiger (HELLLLP!) and that vague I-have-a-million-tests-this-week-make-it-stop feeling. And if you’re not paying attention, you may be walking around in constant *high alert* mode. “All of that tension travels up the back of the neck, causing blood vessels to swell and press on brain tissue,” explains Ehrman. To counter-act this stress-induced stiffness and the headaches it causes, try this trick: A few times a day, you can sit up straight, take a nice deep breath, put your chin to your chest, and roll your head all the way to the left (ahhh)…then back to the right (yup, so much better! ).